Get dependable, long-lasting power from Coppertop batteries. 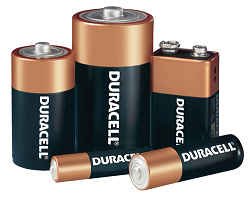 These alkaline batteries have been engineered to deliver just the right level of power for most of your office needs. Plus, they’re guaranteed fresh for 7 years. Coppertop batteries are available in AAA, AA, C, D, and 9-volt sizes.